In the picture above north is at top left and the image covers 56.0 x 70.0 degrees. Image centre is located at 07:56:27.1, +49:18:55 (H:M:S, D:M:S, J2000) Astrometric data from Astrometry.net. Lynx is a modern northern constellation, created by the astronomer Hevelius in the 17th century. It wanders inconspicuously between the distinctive bright stars of Ursa Major to the east and Gemini and Auriga to the west. Lynx was supposedly named because its stars were so faint that lynx-like eyes were needed to see them. Named star in Lynx: (Greek alphabet) Alsciaukat	(31 Lyn), Elvashak (α Lyn), Maculosa (38 Lyn). 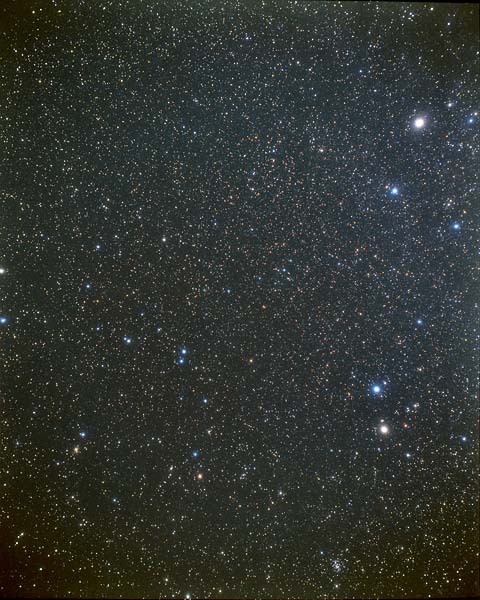 Adjoining constellations: Auriga, Camelopardalis, Cancer, Gemini, Leo Minor, Ursa Major.